WHAT I SMELL: Ambre Cashmere Intense opens with a warmed citrus and a lightly crackling spice. It’s juicy and more full-bodied than the typical light “summer” citrus opening. There’s also a real sweetness to the citrus, as if it’s topped with a light layer of brown sugar and as it begins to develop, a creaminess comes in to provide for a semi-thickened liquid gold consistency. 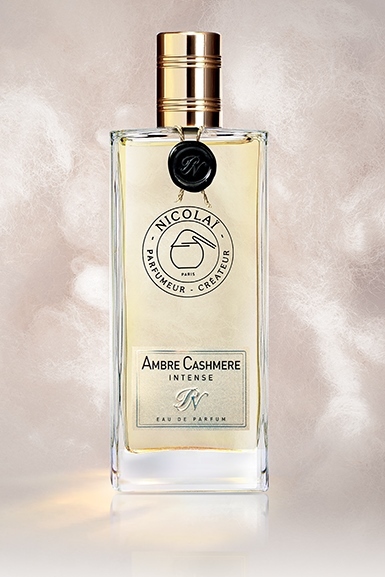 Ambre Cashmere Intense is the sum of its parts rather than a series of notes like a mixed creme smoothie. Plus, there’s a gourmand sweetness the reminds me of sugared pecans sprinkled on vanilla ice cream. After a bit, a peppery note appears and helps to tone down the gourmand sweetness, but the buttery consistency remains intact. After some more time, the sandalwood appears bringing with it the somewhat sharpened hairspray edge. At this point, the perfume is very similar to one of my favorites, Guerlain Samsara. But as soon as I say that, the sandalwood begins to meld with the patchouli and amber which reduces any and all sharp edges making this one cashmere laden gourmand perfume perfect for the fall. The start is made by a light pepper-mandarin vibration, quickly softened by a floral iris bouquet. The ‘amber’ chord of the fragrance is sublimate by vanilla absolute, escorted by Siam benzoin and styrax resinoid. A rich and elegant creation from which the long trail, the tenacity and the sensuality can only be irresistible. WHAT IT SMELLS LIKE TO ME: Sugared nuts with cream. BOTTOM LINE: The opening of Ambre Cashmere Intense was a bit too sweet for my taste, but once the perfume settles down from its initial sugared gourmand lusciousness, the real magic happens as the perfume wraps itself in a comforting creamy silky smooth sandalwood blanket of rich and lovely goodness. Categories: Parfums de Nicolai | Tags: 4 bones, Ambre Cashmere Intense, EDP, Feminine, fragrance, New Release, oriental, parfum, Parfums de Nicolai, Perfume, Perfume Review, review, Sweet, unisex | Permalink. This has been a summer of citrus. Perfect for the hot days of summer because of its freshness, I have found a couple of loves in Parfum d’Empire’s Iskander and Azemour les Orangers. Not all of my citrus encounters have been the same however; Tauer Perfume’s Orange Star bucked that love primarily because the citrus in Orange Star is artificial and not fresh. The same can’t be said about Grand Neroli. I’m not sure if it’s love, but it’s a definite like. WHAT I SMELL: Pure unadulterated sweet juicy orange. Nothing artificial, just the juice of a sun-ripened orange. Lovely. As time goes on, the orange remains without the sweetness and in comes a bit of green and musk. Non-complicated in it’s composition, it’s simpler and less sophisticated than Iskander and Azemour les Orangers, but remains a close cousin… maybe their country cousin? Grand Neroli doesn’t seem to have great longevity, but I’m working off a small sample that I dabbed on and that might make a difference. WHAT IT SMELLS LIKE TO ME: Sunshine and casual Saturday mornings. 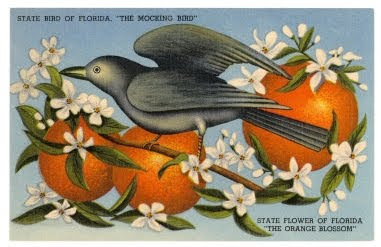 What I imagine Florida to smell like when you’re in the middle of a blossoming orange grove. Categories: Atelier Cologne | Tags: 3 bones, Atelier Cologne, citrus, fragrance, Grand Neroli, orange, review, Sweet | Permalink. My hubby Mark and I had a wonderful trip to the beach this past weekend. Getting away for a little sun and fun for four days was the perfect way to re-charge our batteries. Rehoboth Beach, DE is nice from the standpoint that it’s small enough so that it isn’t too crazy and crowded, but its big enough to have some fun shops and great restaurants. I now have a nice tan and about five extra pounds around my waist thanks to good eating and drinking. 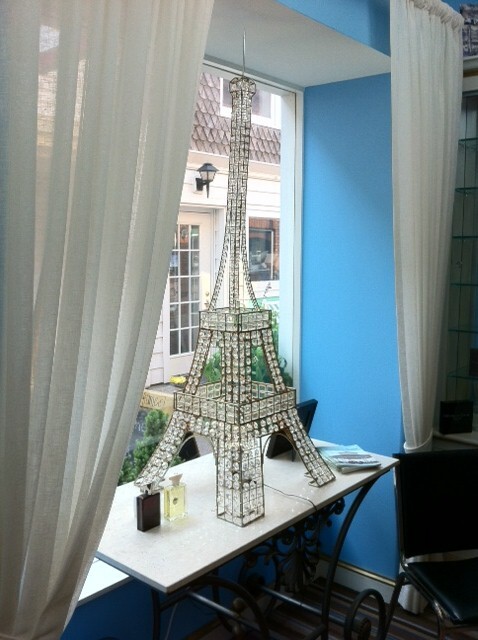 As mentioned in my last post, Rehoboth Beach also has a niche perfumery, Penny Lane Perfumes. For such a small town, this is a great treat. As it’s been a few years since being in Rehoboth and this was my first trip to Penny Lane Perfumes. I’ll be back. Mark and I sauntered into the store mid-afternoon on Sunday after being out on the beach for most of the day. When we arrived, we were greeted warmly by Cassandra, who manages the store. The store’s not big, but it’s perfectly setup with a scent bar and some beautiful displays. Once I got over my initial excitement of being there (which means that I acted like I had major ADHD by getting distracted by shiny bottles, etc. ), we sat down at the bar and got down to business. As we were the only two in the store at the time, we let Cassandra lead us down the road to various fragrance families, starting with florals, then moving too some citrus scents, etc. Again as I was being ADHD, I was ready to start purchasing at first sniff! After spritzing ourselves with our three choices, we headed over to the Mexican Restaurant down the block for happy hour priced Margaritas (which means that we had more than one each). We sat at the bar sniffing each other’s arms, trying to decide which we liked best. The bartender gave us a strange stare until we let her in on what we were doing and she joined in and gave us her opinions. After about an hour, we trekked back to Penny Lane Perfumes and told Cassandra what we decided on. To our surprise, we both fell in love with our respective Keiko Mecheri fragrances! In all, it was a great and fun experience. And here’s a tip for all perfumistas; you’ll never feel guilty about spending money on fragrance if you include your spouse in your excursion! Thanks again to Cassandra for her wonderful assistance. If you ever get a chance to get to Rehoboth Beach, DE, be sure to check them out! 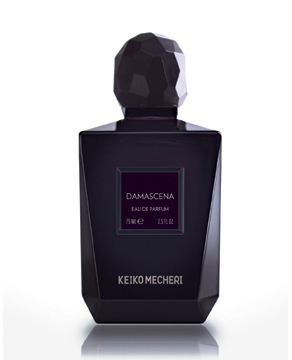 WHAT I SMELL: Damascena isn’t a complex fragrance. When first applied, it seems rather sweet and a little herbaceous. That sweetness is punctuated by juicy black current. It remains in this stage for some time. 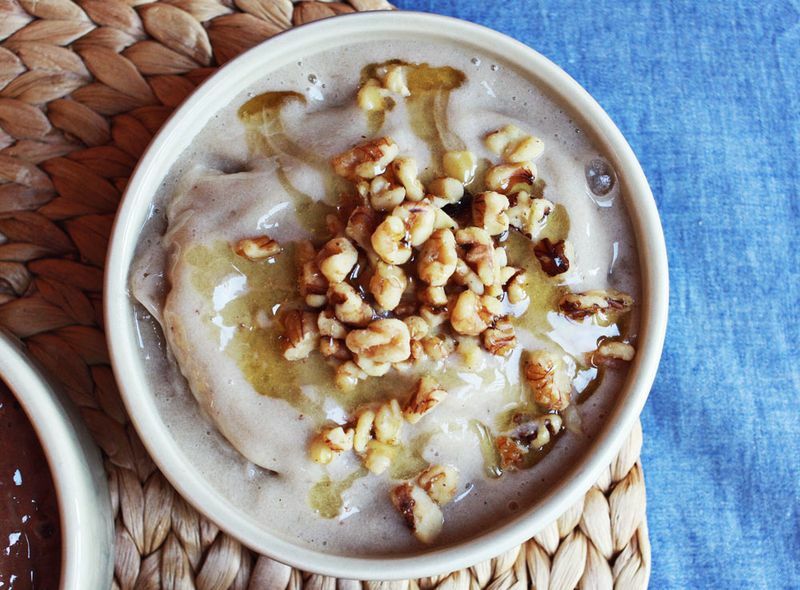 It’s almost edible without being heavy and it’s fresh and fruity without being artificial. As it dries, out comes the rose. It’s a modern rose that’s light and slightly sweet. It’s funny though, each time I wear this, it takes on a slightly different tonality. 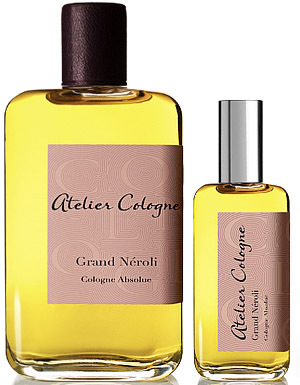 On the first day I wore this it reminded me a great deal like Kilian’s Rose Oud in its drydown. For men, some rose scents can come across as too feminine and some may argue that Damascena may as well. To me, I believe that it can work for both men and women alike. WHAT IT SMELLS LIKE TO ME: When it first goes on, Damascena reminds me of a lovely garden; but a garden that’s not too formal or tended. In the garden, the roses and currents are a bit wild and overgrown and are fragrant in the morning sun and dew. The sweetness of the scent is pure happiness and joy. Categories: Keiko Mecheri | Tags: 4 bones, Damascena, EDP, floral, fragrance, Keiko Mecheri, parfum, Penny Lane Perfumes, review, Sweet, unisex | Permalink.